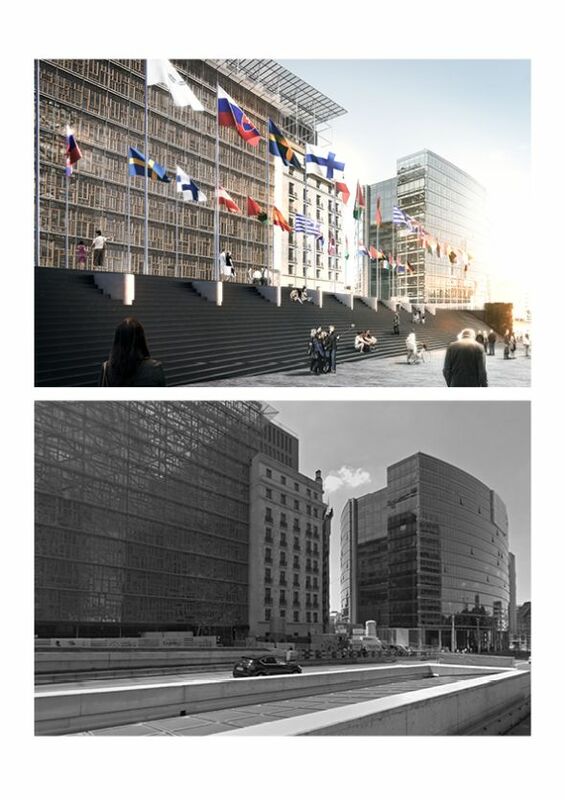 Located at the heart of the European Quarter in Brussels, Schuman roundabout is a symbol of European power. 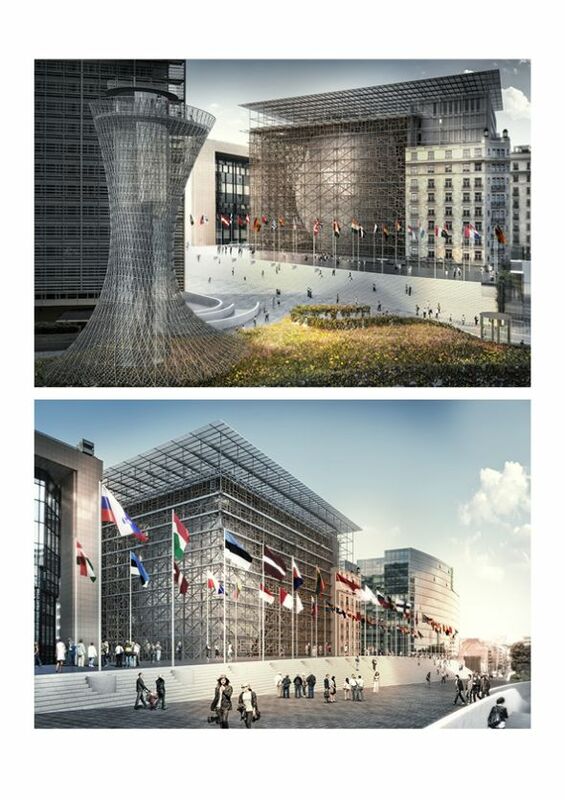 Backdrop for major protests, it is also the meeting place of heads of state and politicians. 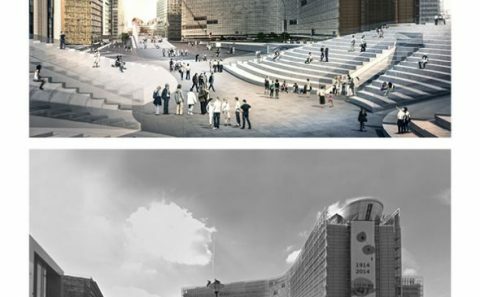 Despite this prestigious reputation, it is harshly criticised for its architecture, considered cold and impersonal. 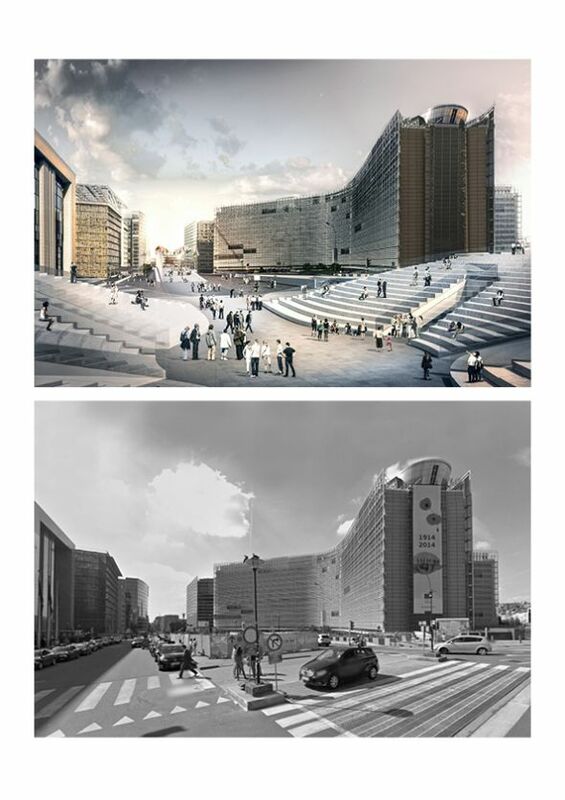 Given over to the mono-functionality of offices, Schuman roundabout is completely deserted outside working hours. 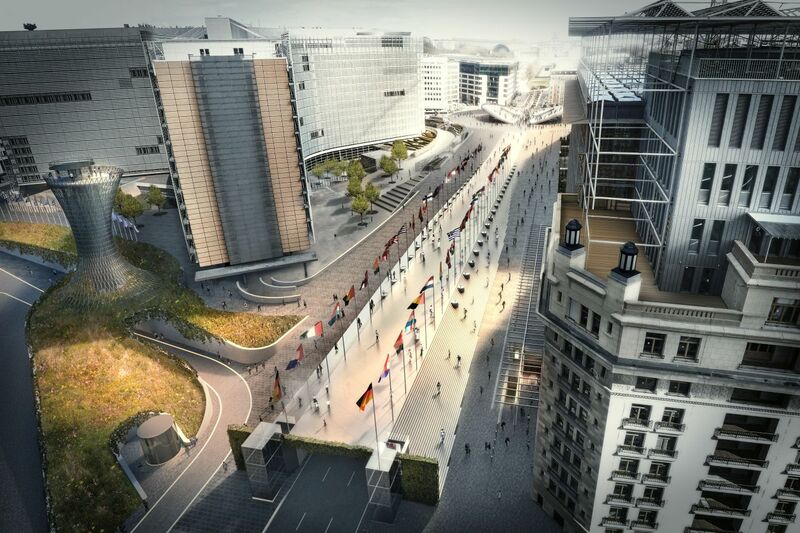 Currently, Rue de la Loi is an inner city motorway, a point where vehicles emerge from the Cinquantenaire Tunnel. 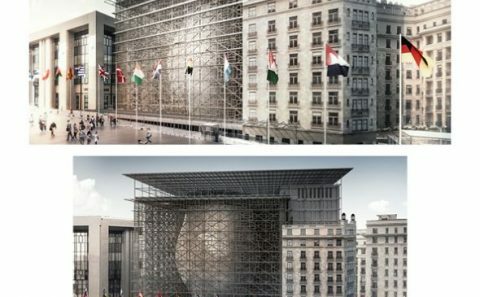 It represents an impenetrable wall separating the European Commission buildings to the North, and the Council buildings, located to the South of the street. 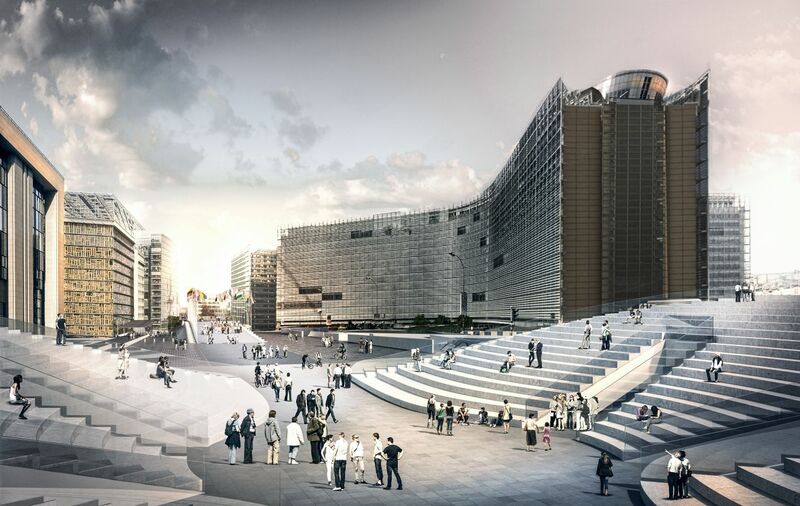 This area is strategically important for the Belgian capital. 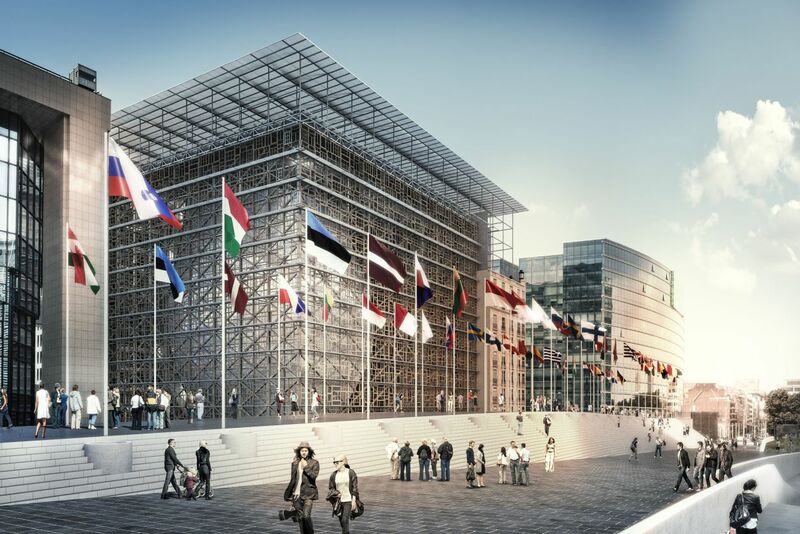 It is at the heart of the European Quarter, flanked by majestic buildings and Cinquantenaire Park. 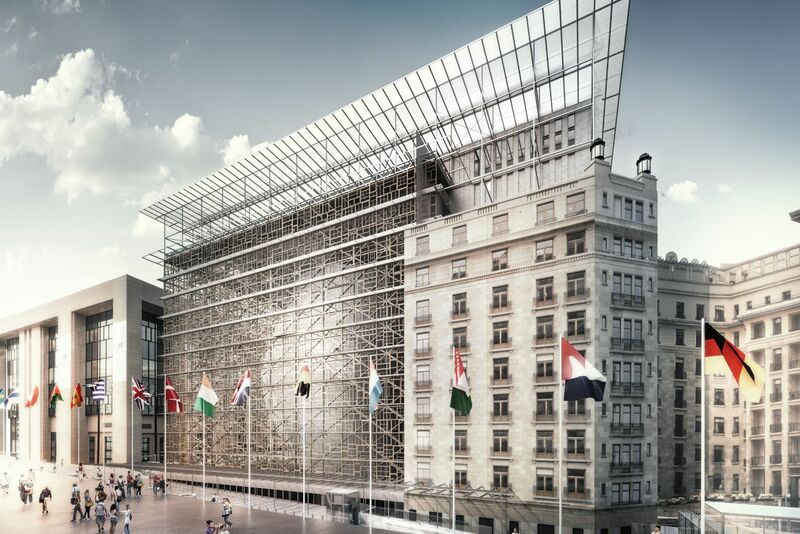 Every day, it is frequented by thousands of European civil servants, as well as Brussels locals. 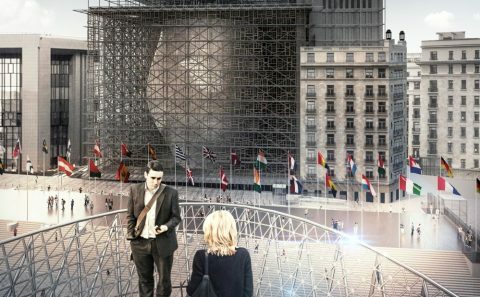 What’s more, it is filmed almost every day by cameras from all over the world. 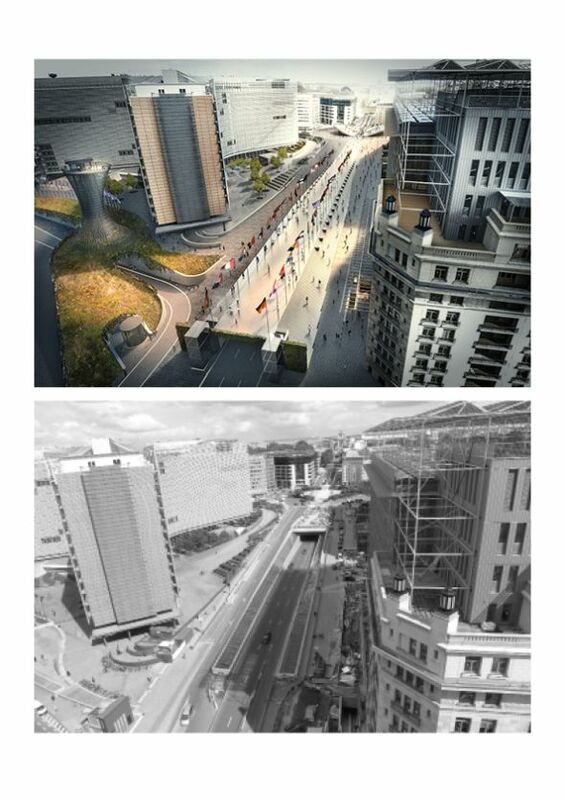 This area deserves exceptional urban planning! 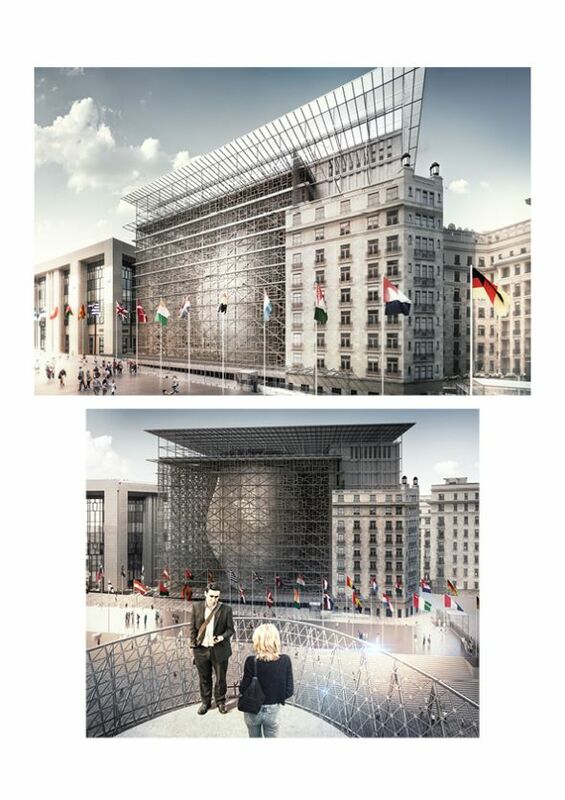 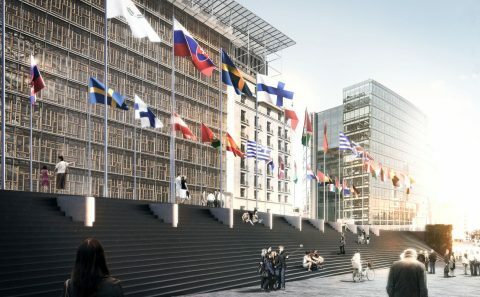 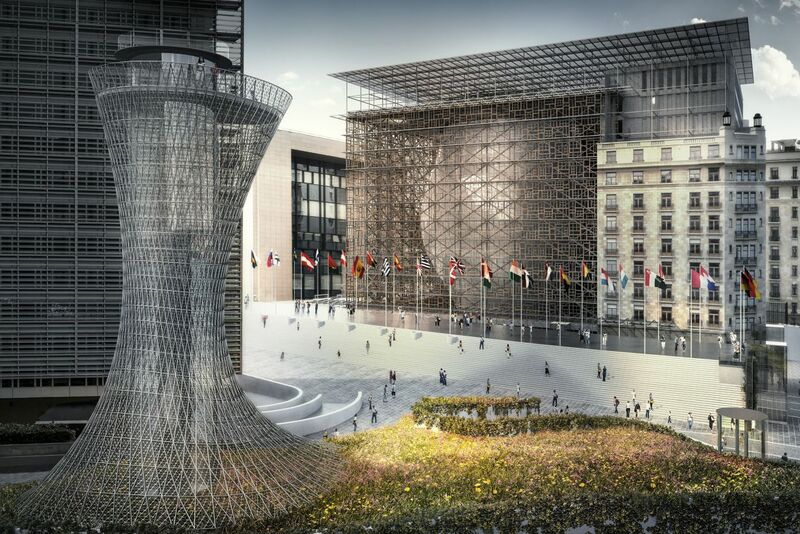 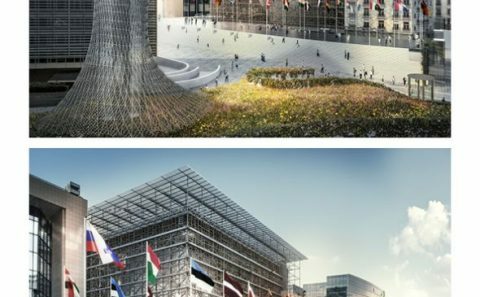 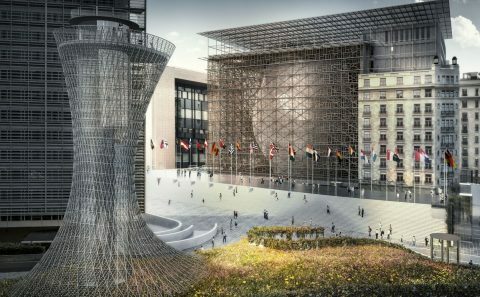 By extending the mainly pedestrianised esplanade located between the Berlaymont Building, home to the Commission and the Justus Lipsius Building, headquarters of the Council, the project intends to conceal the entrance to the road tunnel as far as the Western end of the Europa building. 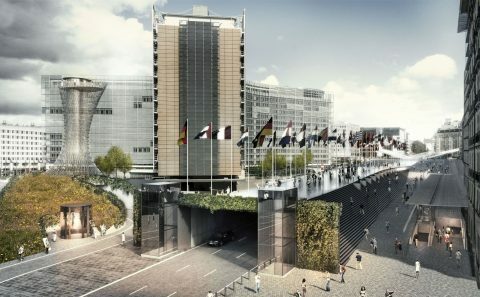 A walkway 12 metres in width and 210 metres in length is created between Schuman Roundabout and the Western end of the Europa Building. 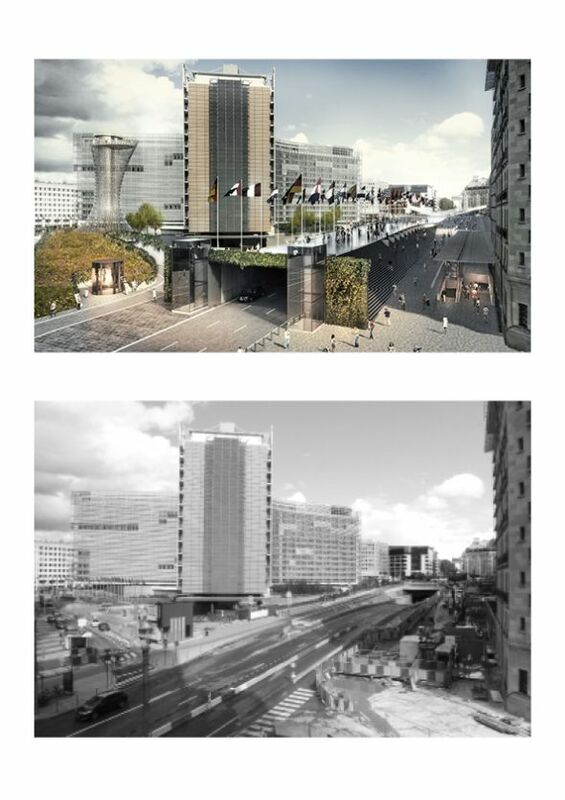 As the walkway rises up to cover the tunnel entrance, stairs on both sides connect it to the rue de la Loi at its current level, transforming both areas into a shared space. 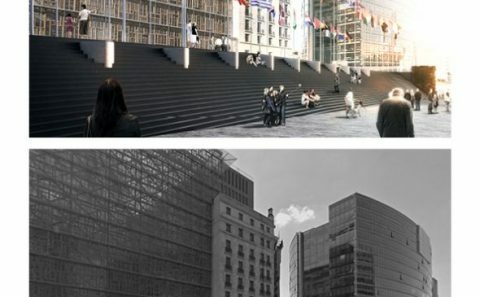 As well as making it possible once again to cross from North to South between the Commission and Council buildings, these stairways are also areas for rest and relaxation, acting as both stage and bleachers. 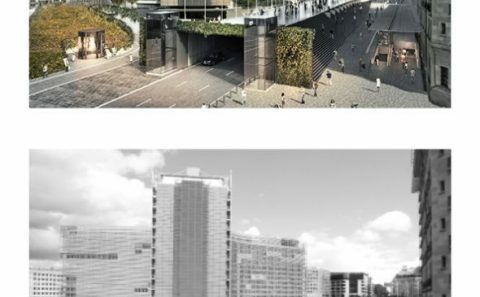 Circular windows drilled through these retain natural light in Schuman transport interchange. 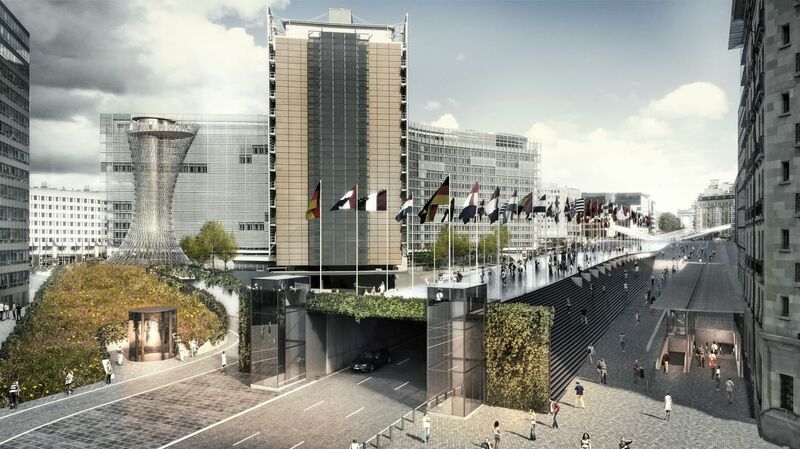 At the Western end, the walkway is flanked by two lifts, providing disabled access. 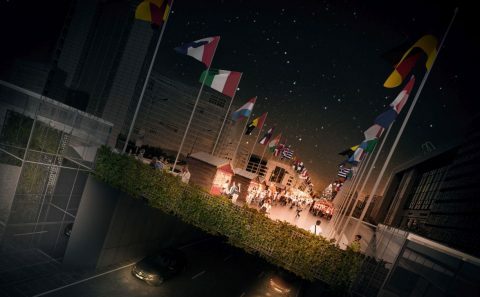 Lined on both sides by 28 flagpoles bearing the colours of the European Union countries, the walkway becomes an urban space in its own right. 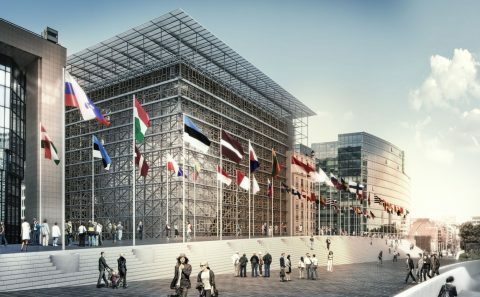 The pedestrianised zone is returned to the people at the heart of the European institutions. 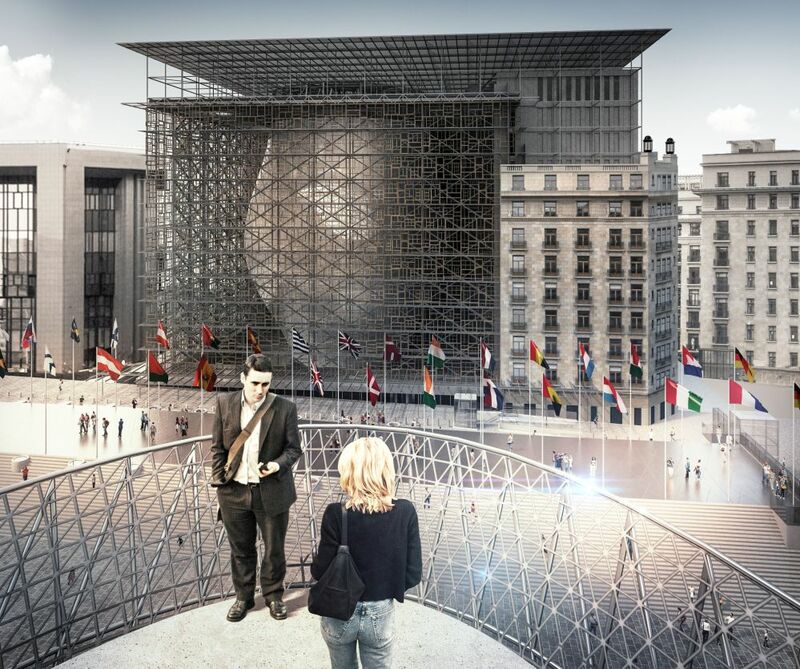 It becomes a belvedere, a gallery of time, an agora, or even the gateway of Europe. 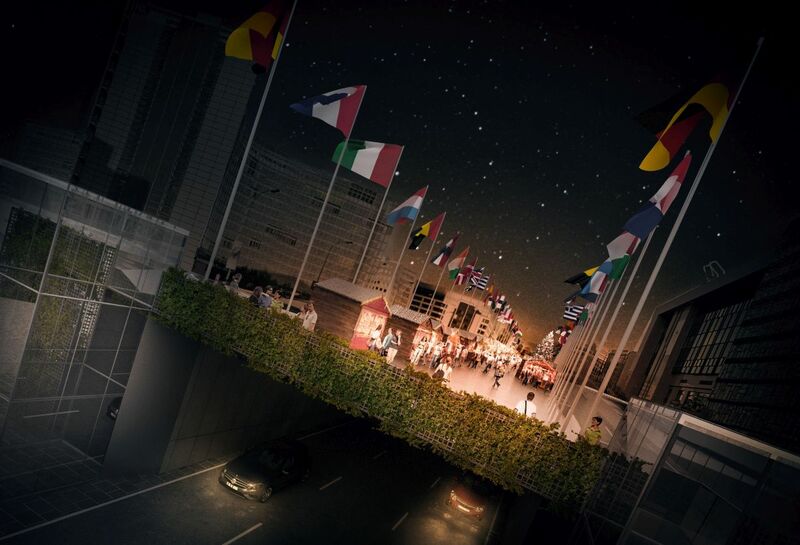 What’s more, this new space will also make it possible to stage events, such as themed markets, fairs and promotions. 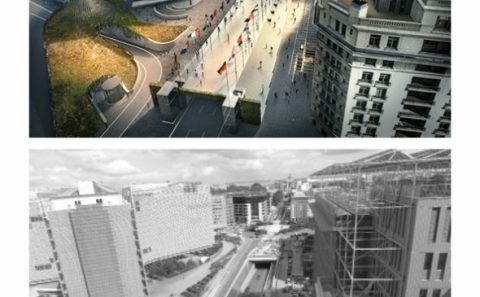 This role will bring a human dimension back to this quarter which, today, is nothing more than a thoroughfare, dedicated mainly to cars.